Print your logo onto these custom printed mobile phone camera lenses or one of our other innovative cameras and use them in your next marketing campaign as a unique giveaway item. Hand out these mobile phone camera lenses for some extra photography fun that phones dont otherwise offer. You can choose from either a Fish eye lens effect + a wide lens of 0.67X OR alternatively a super wide angle 0.4X/ Macro lens. Your logo is printed prominently to remind your customers of this fun phone accessory. Great for any event sponsorship promotion or tourism promotion that captures great memories. *Please note there is a choice of 2 different models to choose from. ❤ All prices are per unit. Other innovative corporate gift ideas that could be suitable to create brand awareness include these cheap promotional Club Dash Cameras 720HD, quirky advertising gifts such as these Block Web Cam Covers or how about using one of our more bespoke custom made products such as these great quality Focus Fish Eye Lenses? Custom brand these snapper selfie sticks or one of our best-selling promotional travel accessories»cameras with your company logo! 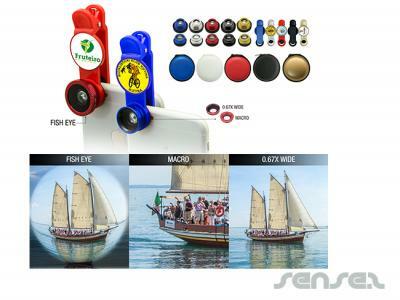 Your promotional mobile phone camera lenses can be silk screen printed in 1 or more colours. Costs shown include a 1 colour logo print on your custom branded mobile phone camera lenses. We can print more than 1 colour, however it incurs extra costs. We can achieve a perfect PMS colour match for the print. Personalise your mobile phone camera lenses or custom design cameras for your marketing campaign. How can these unique promotional mobile phone camera lenses or our personalised cameras fit in with your marketing strategy and help you maximise your brand exposure? Our custom made Mobile Phone Camera Lenses can be produced from a minimum quantity of 100 pieces. We can have your logo branded on these corporate Mobile Phone Camera Lenses in 1 Colour Silkscreen Print. A setup fee of NZ$191.00 will apply to make the film. The delivery time is 3 - 5 weeks from time of your order.